ACR Health Executive Director Wil Murtagh (on stage between zero and six) announces the grand total raised during this year's AIDS Walk/Run. 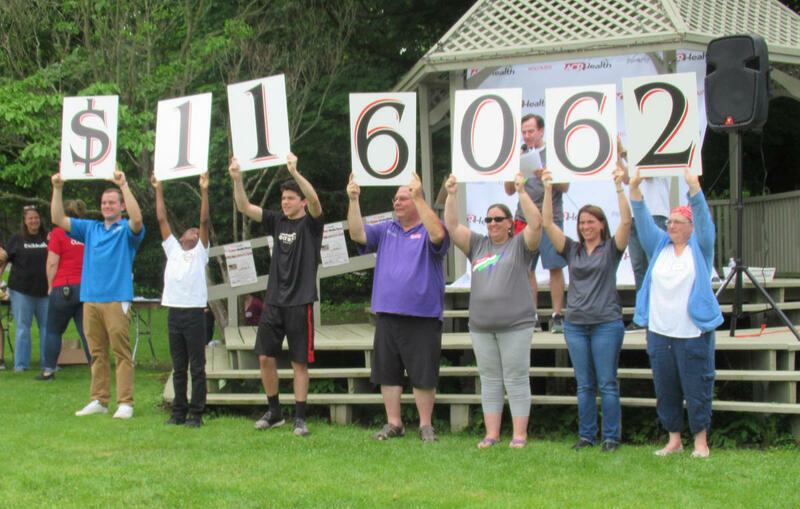 Runners and walkers dedicated to maintaining momentum against HIV and AIDS raised more than $116,600 dollars on Sunday during the 26th annual Walk/Run in Syracuse. Think back to 1993. 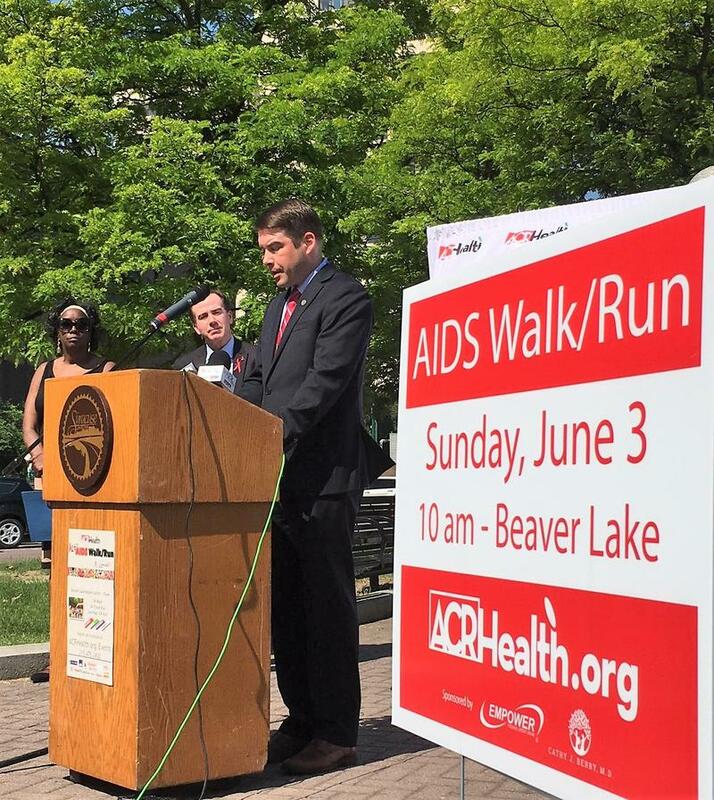 That's when the first AIDS Walk/Run was held. Syracuse, New York State, and the nation were still in the grips of the AIDS epidemic. The number of new cases peaked that year, a decade after scientists first discovered the virus that causes AIDS. Fast forward 26 years, and the number of people diagnosed with HIV is only a fraction of what it was. In fact, ACR Health reports only 30 people were newly diagnosed with HIV in Onondaga County in 2016. That's down from 53 in 2012. Even better, 70 percent of them were virally duspressed within six months, meaning they can't pass on the virus. In all, about 1,200 people are living with diagnosed HIV in Onondaga County. State health officials estimate 93 percent of those living with HIV in New York have been identified, and of thsoe, 80 percent are receving medical treatment. Prescriptions for PrEP have quadrupled. That's the daily medicine that prevents the spread of HIV. Despite the progress, ACR Health Executive Director Wil Murtaugh says the disease remains a threat, in addition to new epidemics of addiction and poverty. ACR Health is using the occasion of its upcoming 26th annual AIDS Walk/Run to call attention to another growing public health threat: The Hepatitis C virus. Officials say while the rate of new HIV and AIDS cases continue to decline, Hepatitis C cases have soared in recent years. ACR Health Executive Director Wil Murtaugh says this area is especially vulnerable. 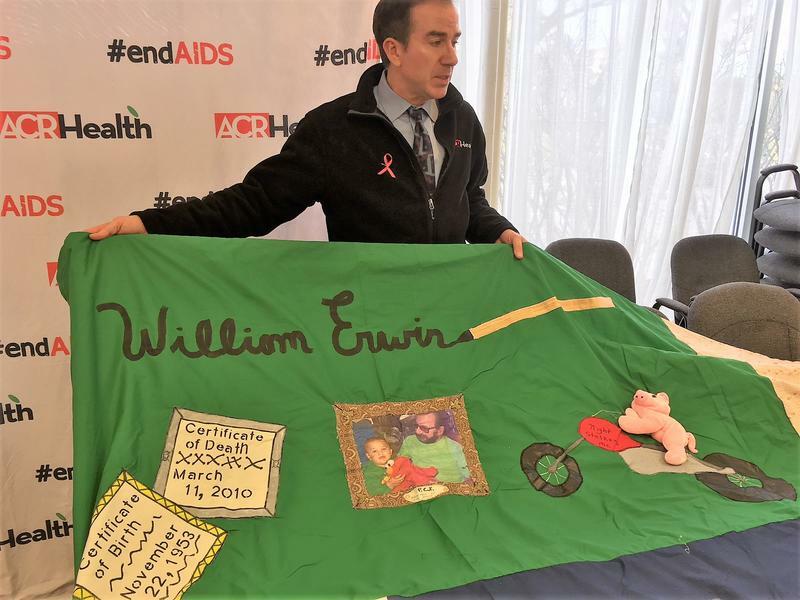 Central New Yorkers marked World AIDS day today by remembering those who died of the disease, but also celebrating progress of AIDS prevention in New York State. ACR Health Executive Director Wil Murtaugh says the state’s increase in the supplement of Pre-exposure Pills, or PrEP, is helping stop the disease before it can be contracted.